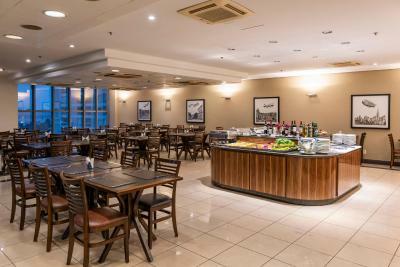 Lock in a great price for Monreale Hotels Guarulhos-São Paulo – rated 8.3 by recent guests! Staff were all friendly and caring. The restaurant serves fresh meals. Courtesy airport shuttle was easy and efficient. We appreciated the free shuttle service to the airport. The free coffee at the reception was a bonus. The quietness of the room was pleasant. Free shuttle from airport and good spread for breakfast. Room was clean and confortable. Staff are not all proficient in English but tries their best. Was there to pick up my wife at the airport the following morning. Unfortunately her flight was cancelled and I was stuck waiting in the city for her to arrive that evening. 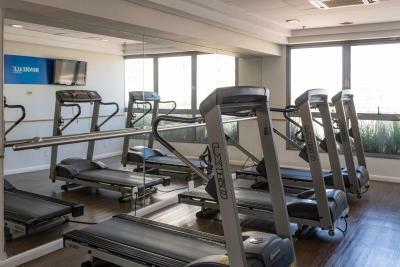 The hotel was very accommodating and allowed me to wait in the lobby and use the exercise room and patio while I waited. Great value for money, free airport transfers, stocked mini bar, luxurious room feel. The staff was super friendly! I couldn't find the free airport shuttle at the airport as the directions given via email were incorrect, however upon arrival the receptionist offered me free dinner as compensation for this. The staff at dinner and breakfast were also great and taught me some Portuguese words to get by. The room was really nice and comfortable too. Great stay overall! I had early morning flight so I found this location ideal place to get to the airport from. Shuttle bus offered was excellent, staff was great and hard working. 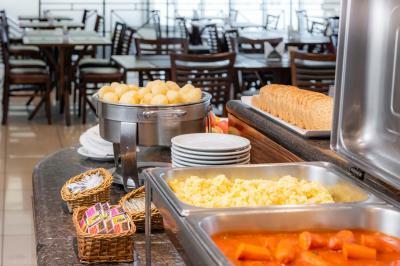 I didn't have time for breakfast but walked into the restaurant to grab some juice and whatever I could grab for by bus, the food looked very good and well set up. Gym and other facilities were also good. Very clean and well maintained hotel, I wished my flight would have been little later so I could stayed couple more hours. An airport hotel needs to meet 3 criteria. 1) cheap 2) convenient and 3) comfortable. This hotel met 1 criteria only. It is cheap - but that is about it. 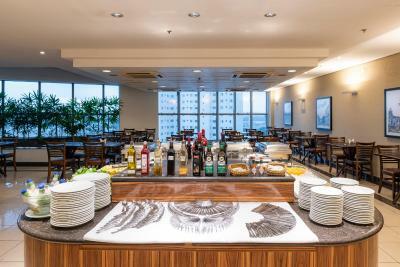 Monreale Hotels Guarulhos-São Paulo This rating is a reflection of how the property compares to the industry standard when it comes to price, facilities and services available. It's based on a self-evaluation by the property. Use this rating to help choose your stay! 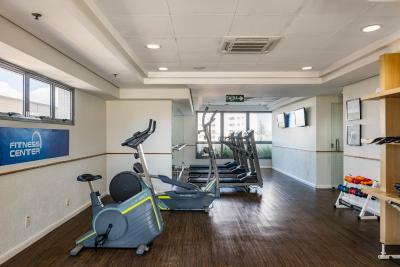 One of our top picks in Guarulhos.Located in the heart of Guarulhos, Monreale Hotels Guarulhos offers a gym, a dry sauna and free Wi-Fi throughout. 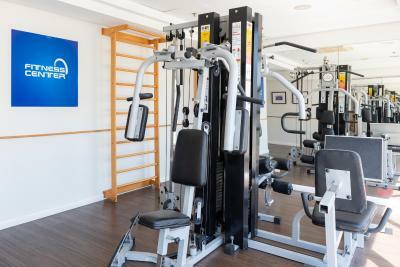 All air-conditioned rooms are equipped with cable TV, a mini-bar, and a private bathroom. Room service is available 24/7, as well as free shuttle service. 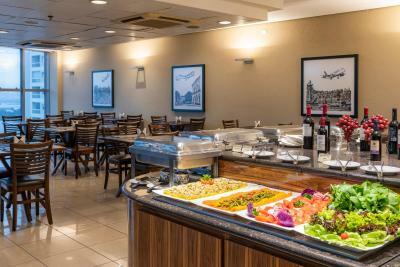 Monreale Guarulhos Hotel’s restaurant serves international cuisine. 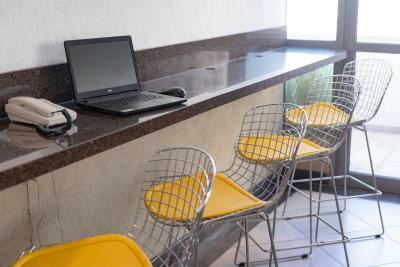 Guests can benefit from the convenient 24-hour front desk service Monreale provides. It also offers massage and laundry services. The Bosque Maia park is only 0.6 mi away. Shuttles to the airport can be arranged for an extra fee and subject to availability. 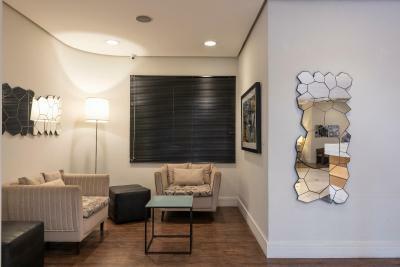 This property is also rated for the best value in Guarulhos! Guests are getting more for their money when compared to other properties in this city. 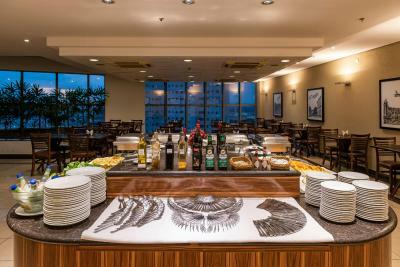 When would you like to stay at Monreale Hotels Guarulhos-São Paulo? This air-conditioned room comes equipped with a TV with cable channels, minibar and a private bathroom with a shower and hairdryer. Private parking is available on site (reservation is needed) and costs BRL 13 per day. 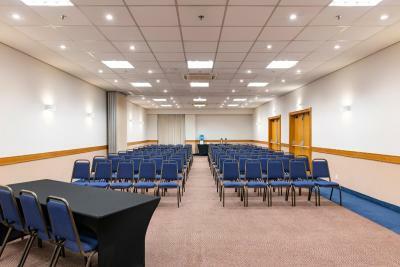 This spacious room comes equipped with a flat-screen TV with cable channels, work desk and digital safe. 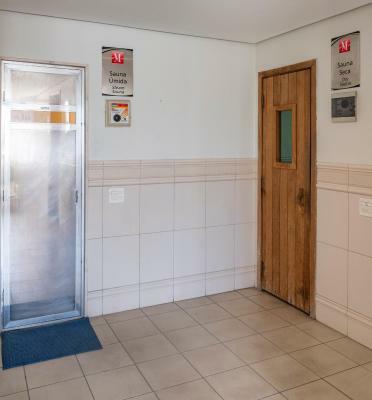 The private bathroom has a shower, hairdryer and a floor-to-ceiling mirror. This twin room has a mini-bar, cable TV and air conditioning. 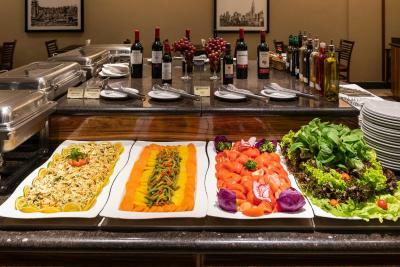 House Rules Monreale Hotels Guarulhos-São Paulo takes special requests – add in the next step! 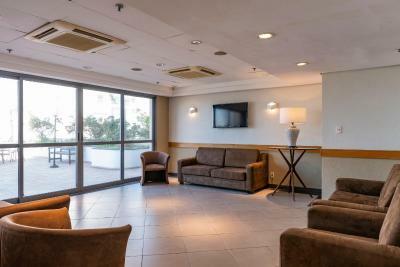 Monreale Hotels Guarulhos-São Paulo accepts these cards and reserves the right to temporarily hold an amount prior to arrival. 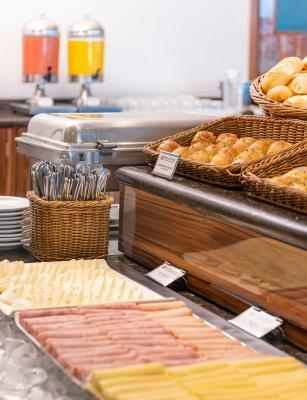 According to the Brazilian Federal Law 8.069/1990, minors under 18 years old cannot check into hotels unless they are accompanied by their parents or a designated adult. 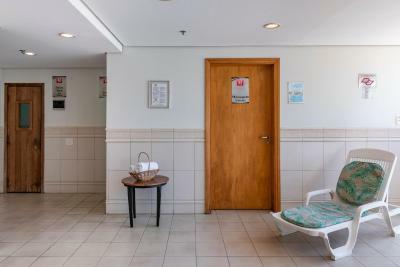 If the minor is accompanied by an adult other than his parents, it will be necessary to present a written authorization for the minor to check into the hotel. Such authorization must be notarized and signed by both parents. Internet was difficult to access and once had access, still had to keep choosing a network. But this was a minor issue. I’d definitely stay here again. Nothing that I didn't like! Had a good experience. Requested higher floor for quietness because of arriving late at night and needed a good night sleep. Hotel reservations staff responded fast confirming my request which maid me really happy. When on check in time at 12.30am they gave a very nice room located on 13th floor (last floor of the building). Breakfast included and very yummy. Free Hotel-Airport transfer was much appreciated! Overall a very pleasant stay. Will definitely stay in this Hotel next time I'm in Guarulhos again. A good place to stay... and in my case, near the Hospital Carlos Chagas to see my mother!! The hair dryer was out of order. 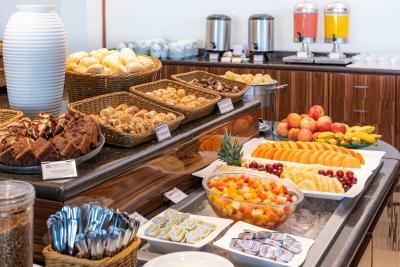 The breakfast was poor in fruits and full of carbohidrates. Airplort shuttle is convenient. the room has a desk, which is good during business trips. The bed was not very comfortable and did not have a duvet. The air conditioner in the room was not working well. The bathroom was not very clean even though it smelled of chlorine. The floor in the room was sticky. I'm not a clean freak but this was below what I was expecting. 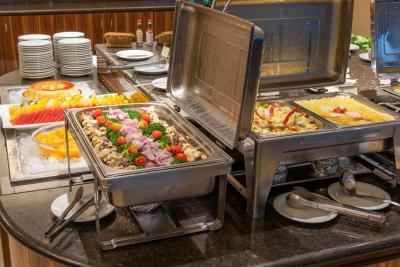 The breakfast was decent, though there are other properties nearby where the overall quality is better. The staff seemed indifferent both during check-in and check-out. The bed was a bit smaller than we would have liked. We had a 11 hour layover during the night in Sao Paulo, so we booked this hotel for some sleep in stead of staying on the airport. The shower was really nice. 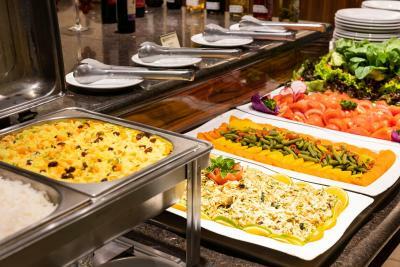 Also the buffet in the restaurant was tasty. In addition the shuttle service was good as well.